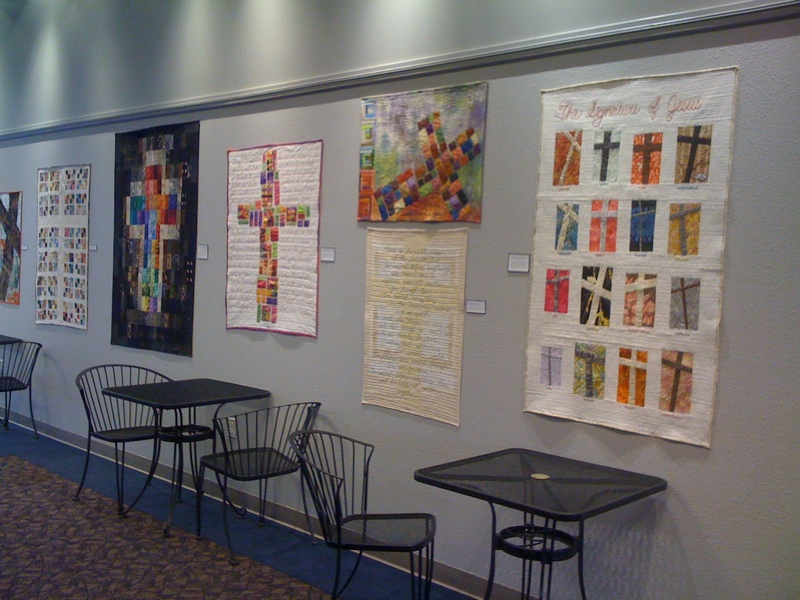 Two years ago I had the opportunity to do an exhibit of my Housetop Quilts at the Oak Hills Church in Folsom, CA. 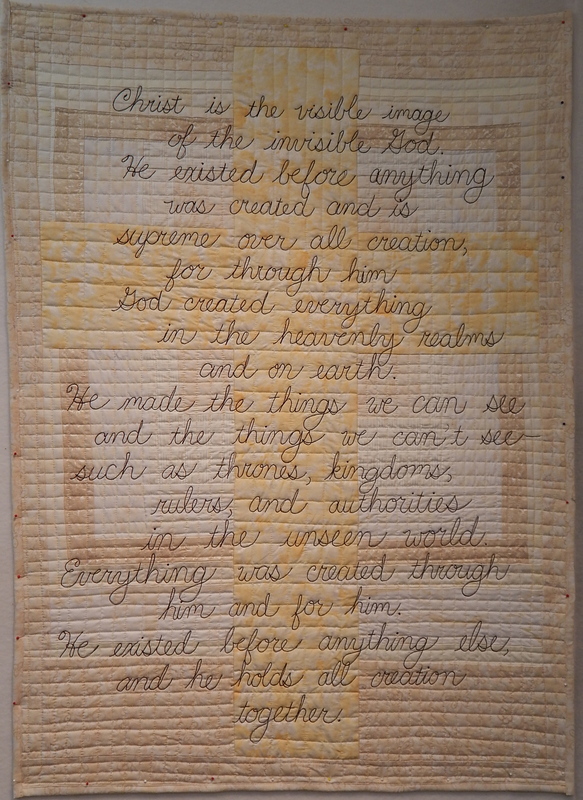 Since then I have worked on two new series of quilts, The Psalms, and The Signature of Jesus. 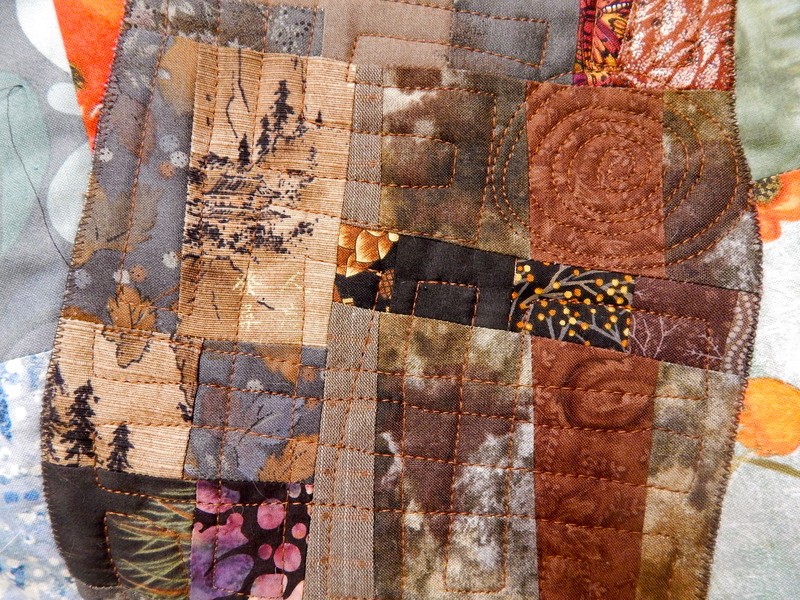 And Monday, I delivered 25 quilts to Oak Hills. They will be on display until Easter Sunday, April 5. Anyone is welcome to visit and view them. Of course, the gallery area will be open every Sunday morning, from about 9am-12noon. And you can also visit during the week, Tuesday through Friday. Just call the church office (916.983.0181) to make sure the gallery is open. (The gallery is in their very large sanctuary lobby.) 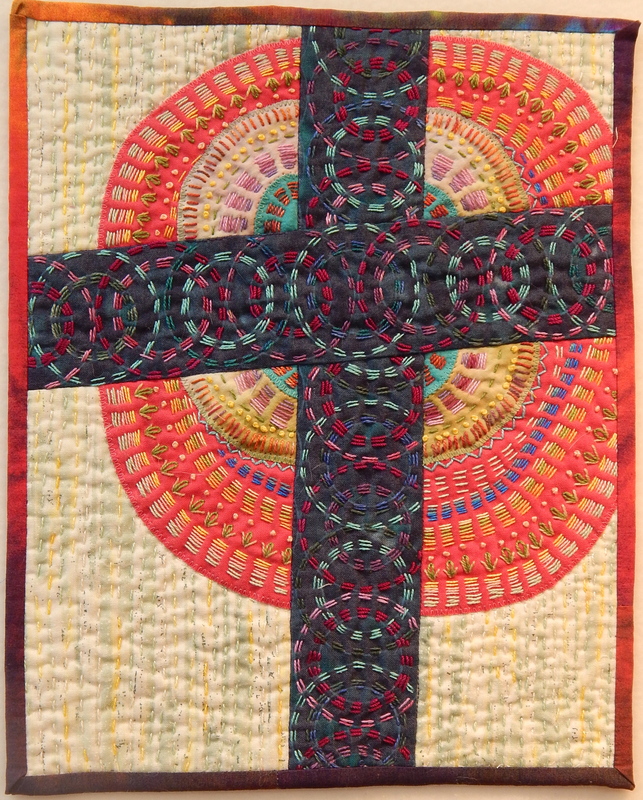 I will be at the church this Sunday, February 22, sitting and demonstrating my handwork. Fun! I can’t say enough good things about this church. They have encouraged me to be an artist, and have provided an opportunity to share my work with others. 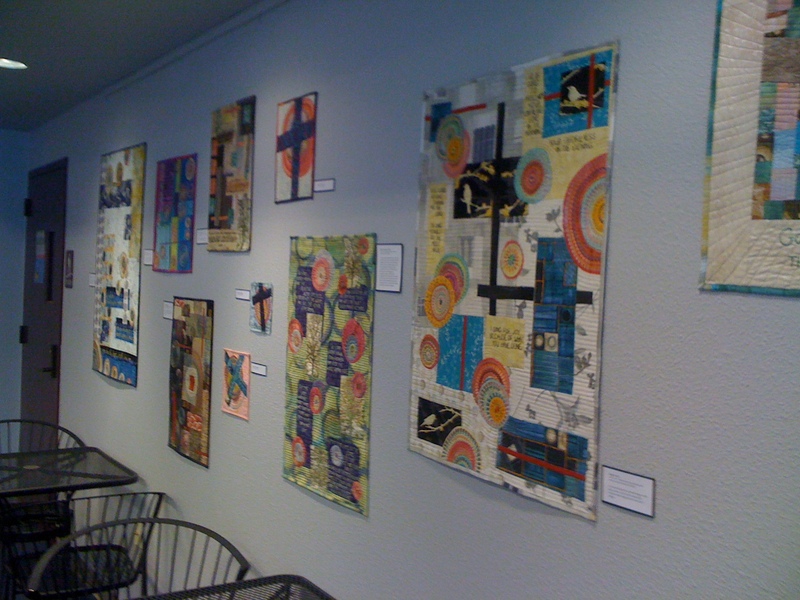 When I delivered the quilts, two artists were there to help hang them, and they were laid out and arranged and rearranged to make a beautiful display. It is truly exciting to be able to see all of your work in one sitting like this. Teresa is the artist in charge of the program. She makes Pysanki eggs–they are phenomenal! Go to her website and view the galleries–you will be amazed! And another bit of very good news! 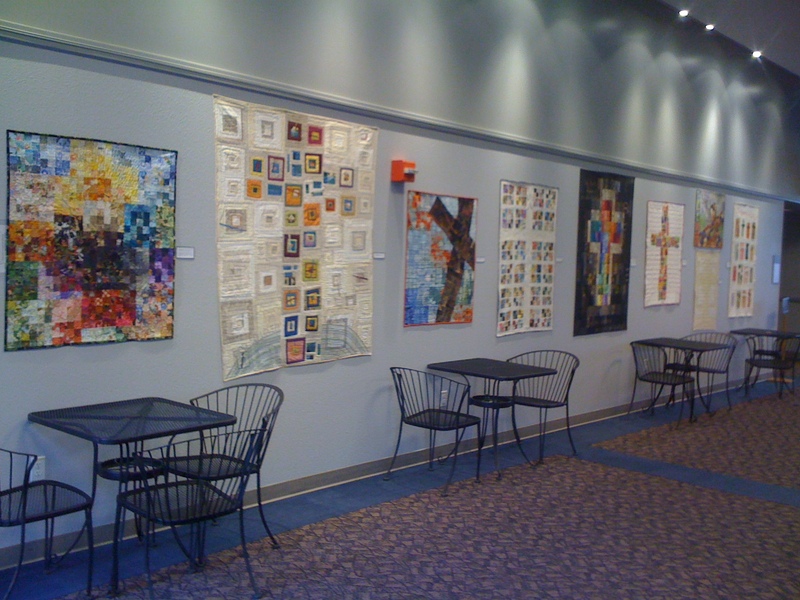 The Quilt Show has gotten the kinks out of their system, and are set up for people to be able to view “my” show for free February 22 through March 8. Clicking on this link should take you directly to the show. THIS LINK WILL NOT WORK UNTIL FEBRUARY 22. I hope you will watch and enjoy. 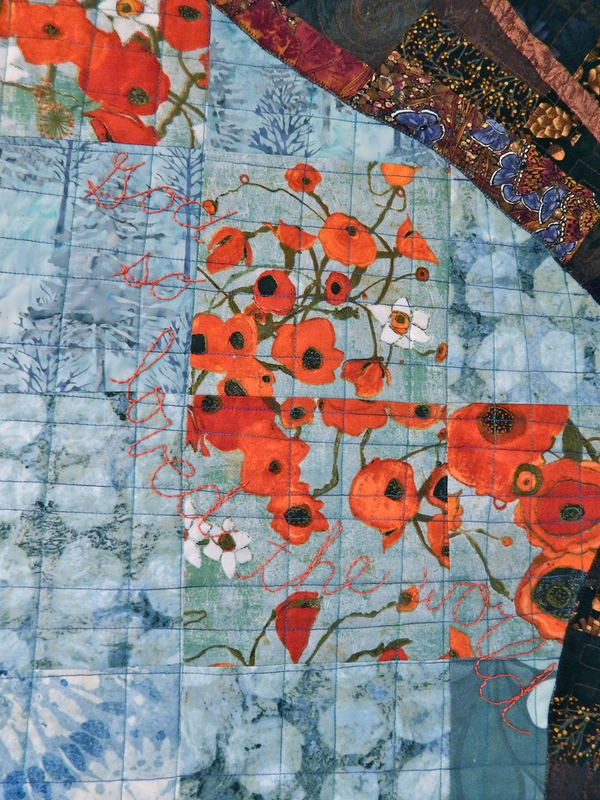 The Quilt Show does a wonderful professional job at producing each show. I truly enjoy watching each new episode. In addition, TQS has a wonderful website with lots of free instructions, ideas, news, and just fun stuff. Here’s the trailer they created for my show! 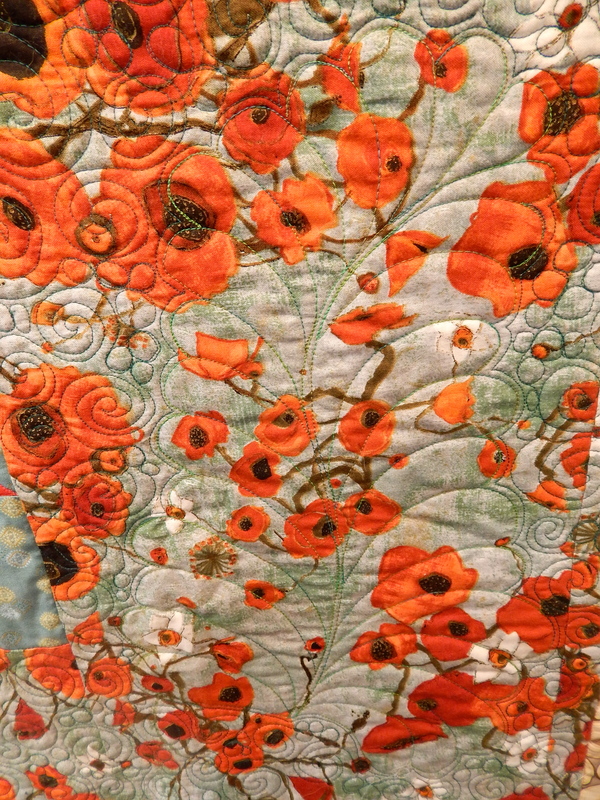 And I realized that at that point I had finished all the quilts that I had planned to finish for this exhibit. SUCH a good feeling. 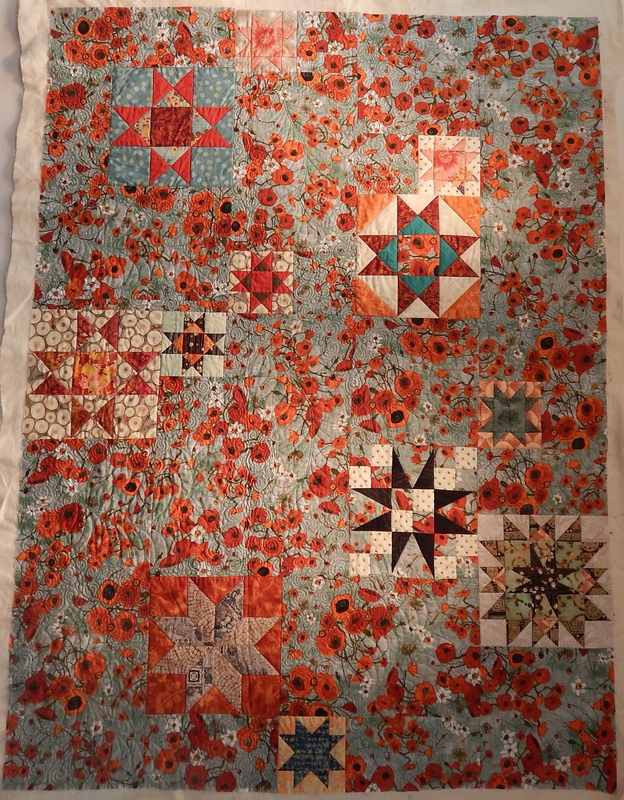 Now, sure, there is another quilt in my mind that I would REALLY like to do, but it will just be a bonus if I do happen to have time to get it done. I am going to a rug hooking retreat next week, which requires that I switch gears, and so it feels very good to have this group of quilts completed. Then I began the tedious job of putting the lettering on. I actually mostly like this tedious job. It involves a bit of measuring and counting, and that appeals to my mathematical side. I measured the lines at 1 1/2 inches, and used Gwen Marston’s “thumbnail method” of marking the lines. And then I used my blue pen to actually write the lettering carefully. I used dark brown thread, and planned to go over the lettering twice to make it as visible as I intended for it to be (sometimes I don’t want the words to be as visible.) In the mark once, check twice department, halfway through the stitching, I decided I needed to check the wording against my Bible. And sure enough, I had left out an entire line!! Thank goodness I found it right BEFORE I stitched it. I just had to erase all those lines of blue lettering by spritzing it with water, and wait for it to dry, and then finish the lettering. And then this quilt. My problem child. I did this BIG quilt quite a while ago. 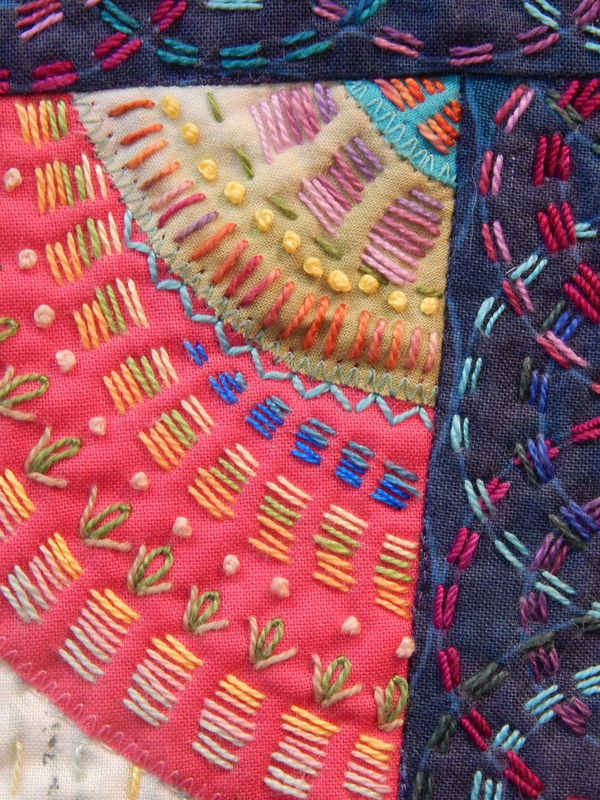 And then I decided that I should put a lot of kantha stitching at the bottom, indicating the world. Halfway through all that stitching, I didn’t really like it. But I stubbornly continued on. 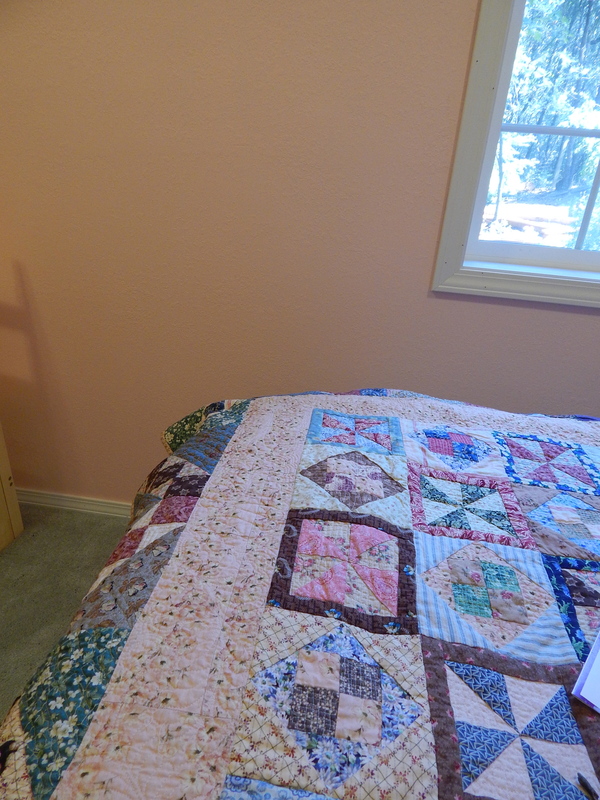 And of course, the stitching really skewed an already lopsided quilt. And THEN, where I wanted to put the simple lettering (GOD SO LOVED THE WORLD,) there was a purple stick of fabric that would be right in the way. 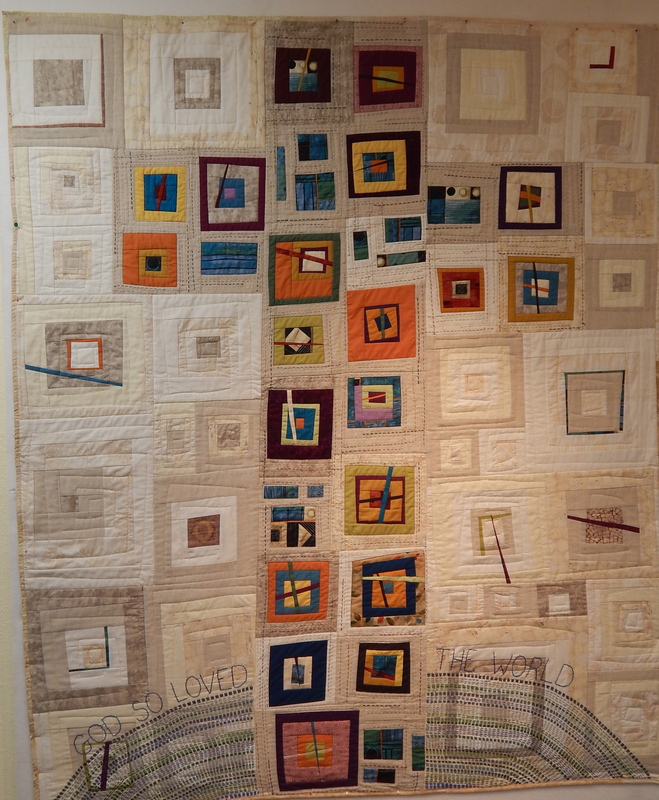 Well, I’m getting down to the deadline for this exhibit*, and so I got this quilt out ONE. MORE. TIME. I remembered that I could appliqué a patch of background color over the stick, and with the lettering over it, it wouldn’t even be noticeable. And then, with my experience of the past couple of quilts, where I have blocked them on my design wall, I was able to spray it lightly with water, and do a decent job of blocking some of the skewy-ness out of it. 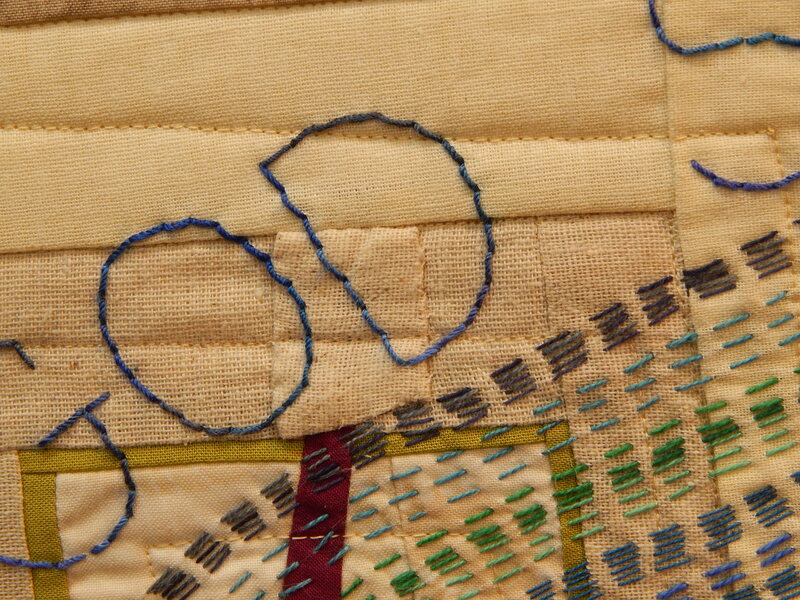 Here’s where I put the patch–that purple stick of fabric continued up and would have interfered with the lettering. *The Signature of Jesus series, and The Psalms series will be exhibited at Oak Hills Church in Folsom from February 22 through March 15. In the middle of that artist’s holiday, inspiration struck me! 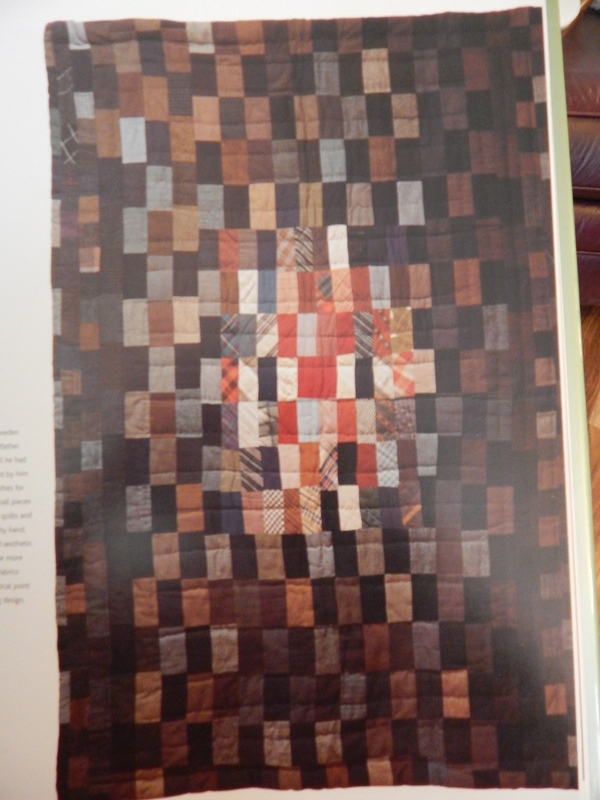 I was looking through a book called Quilted Planet, when a certain quilt struck my fancy. It really just brought to mind an old idea I had, based on the words at the end of the poem in John 1 “The light shines in the darkness, and the darkness can never extinguish it.” I’d had in mind a cross (for the series The Signature of Jesus) shining in the darkness. 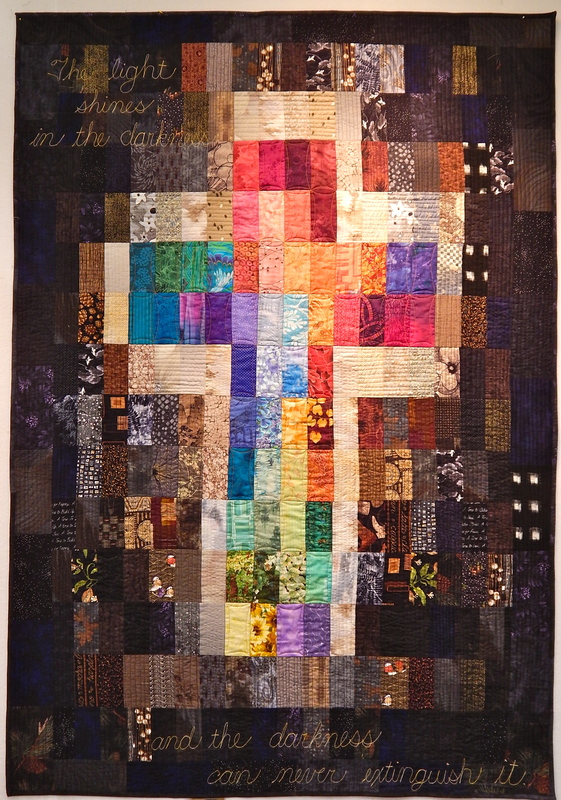 When I see a quilt that inspires me, in general I just keep the idea in the back of my mind, and on purpose, I don’t go back and look at it, so I will be doing my own work. 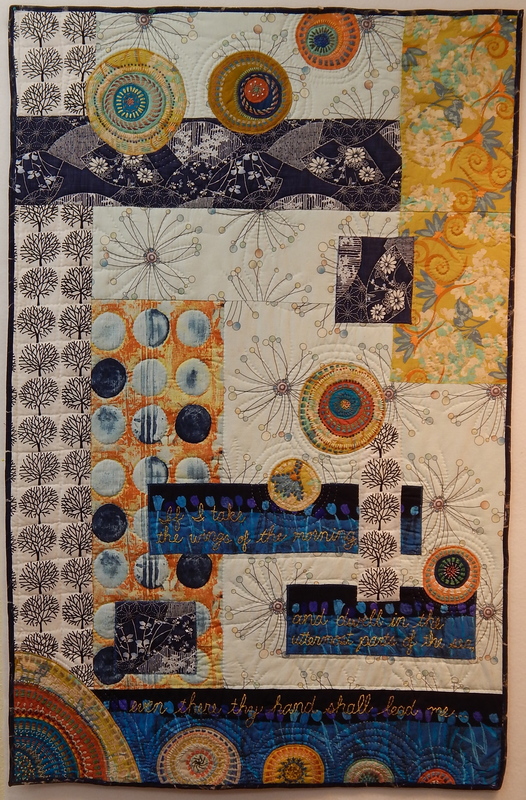 I took from this quilt the idea of using rectangles as a construction unit. And this time I even wanted them to be all the same size, so I found a template that would work, and got out my big box of scraps, and cut out a million rectangles. 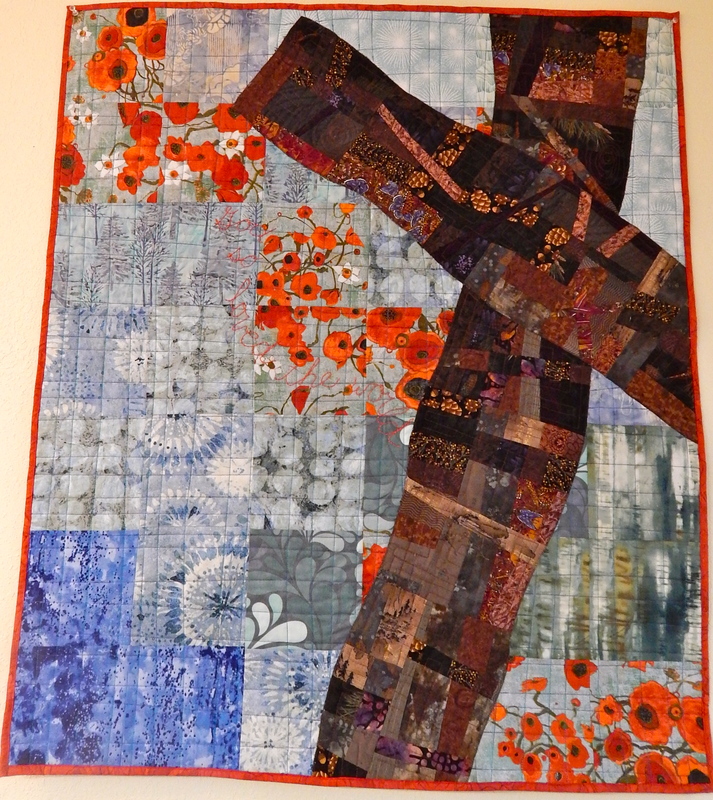 All different colors for the cross, and a variety of neutrals, shading from beige to gray to black for the background. I worked quite a while on this piece on the design wall, and it was not coming out at all what I envisioned it to be. I knew it was a problem of values, but sometimes I get stuck on the fabric and I don’t want to change. I almost gave up, but then I found my original inspiration, and tried one more time. I cut out a lot more light and dark squares, and ta da! I am very pleased with the outcome. 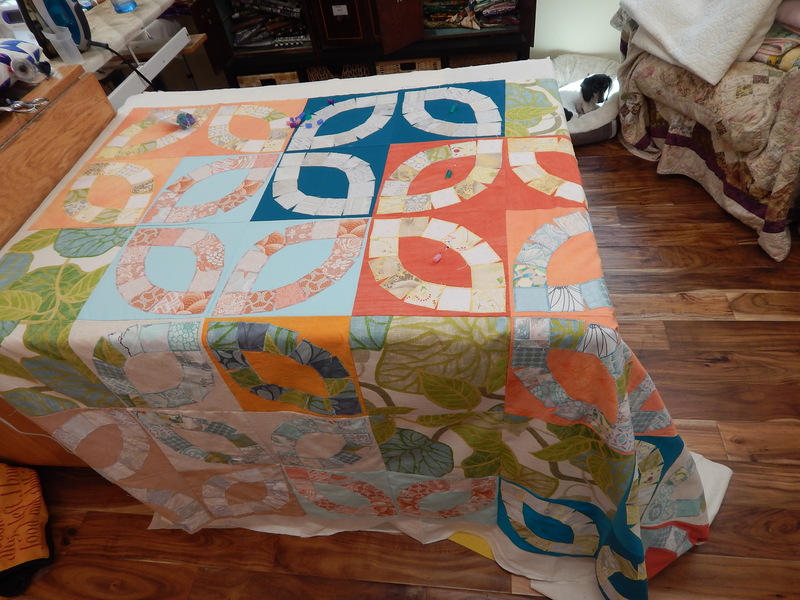 I started quilting it, and then, AS USUAL, struck a road block. I did not know how I was going to quilt it. Fortunately, I had another quilt waiting in the wings for some finishing quilting, so I got that out and completely finished it! 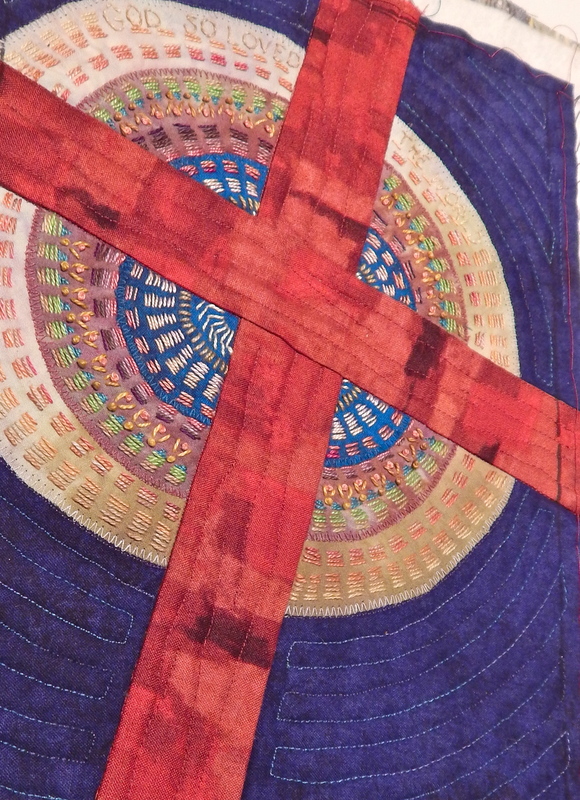 And in the meantime, I decided on a simple plan for quilting the dark cross. 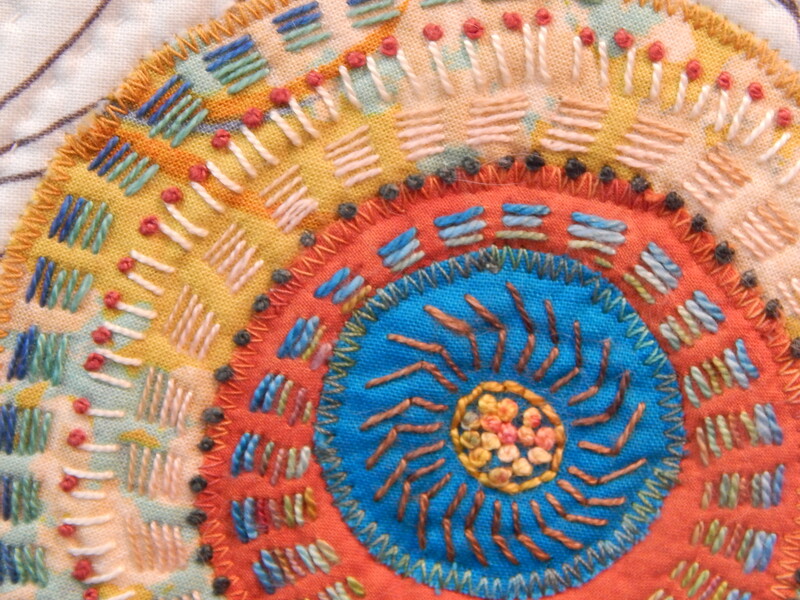 Don’t you just love quilting? Well, you knew I would have to do something with that pile of pretty fabrics that I DYED ALL BY MYSELF! I am surprised at how delighted I am with this new skill set. I am dreaming of turning my old laundry dungeon into a wet studio when all the other work on the house is done! So, I didn’t measure to make sure I would have enough fabric for each section. Partly because I didn’t know until I got to that part how much fabric I would need. When I got to the final round, not only did I NOT have enough of the green, I also cut the first two pieces incorrectly. I took a lunch break and stewed over what I was going to do. In the end, I increased the size of the purple pieces by one inch, so the greens that I had cut too short would now be the right size. And I decided to use a different color on the bottom border. And then when I was auditioning it on my design wall, I decided that I’d just go for it and make that border even bigger. I like this piece. I don’t like accurate cutting and piecing, especially when I am the one having to figure it out. I ripped out a lot of seams. And using the mottled hand-dyes? Sometimes a weird ghostly bunny face appears right where you don’t want it, and you have to cut another piece of fabric and undo another seam. 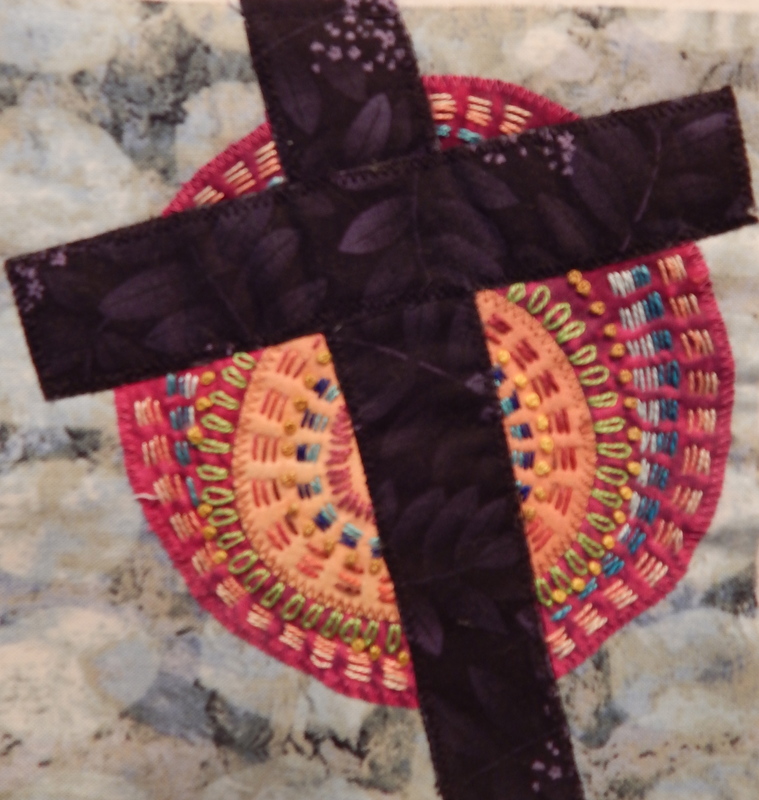 Because when you might use the quilt in your series “The Signature of Jesus,” you don’t want a bunny face on it. In my last post I hinted at a special event coming up. I wrote about that on my other blog, Part 1 and Part 2. 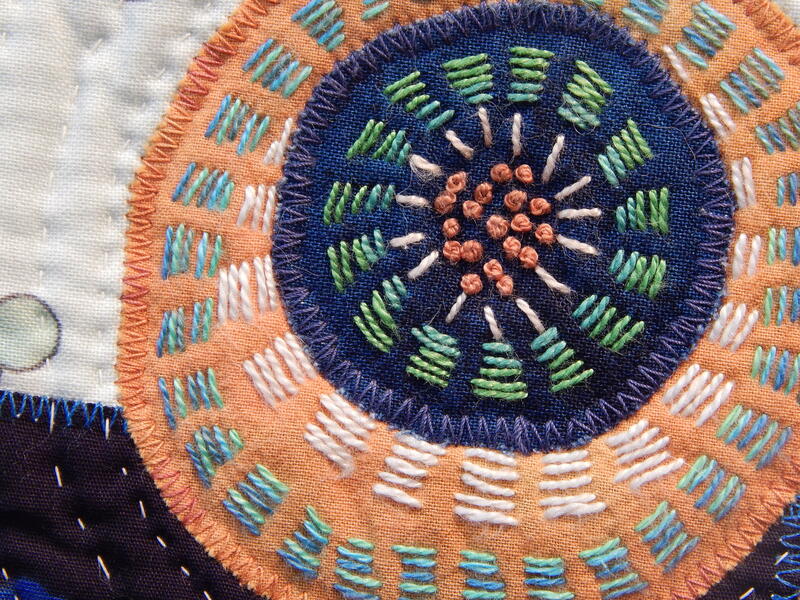 I was a guest on The Quilt Show! What I didn’t write about over there was some of the prep work I did for the show. I put quilt sleeves on twelve quilts!! I have never liked quilt sleeves. They don’t seem that helpful for the average non-quilty person. And I think I was a little afraid of them, because I had never done them. But I found Libby Lehman’s wonderful instructions, and now I am an expert on the sleeve of the quilt! Getting ready for the show had me concentrating on finishing some long-overdue quilts, and putting the final touches and words on others. I had it on the design wall for quite a long time, trying to figure out what words and where to put them. 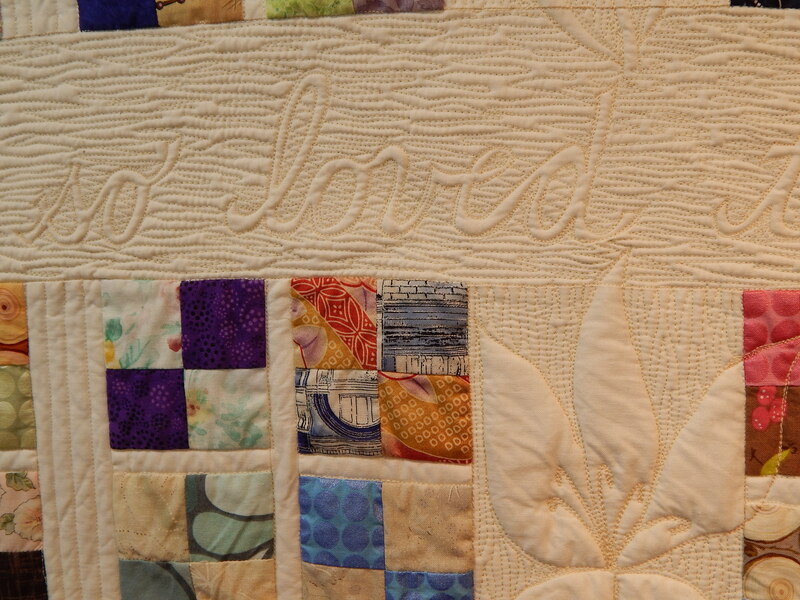 And then I got an inspiration–just put the original words that you are putting on all the cross quilts (God so loved the world) but add them to the flower design. Hidden, and yet visible–just as God is so often! I love it! 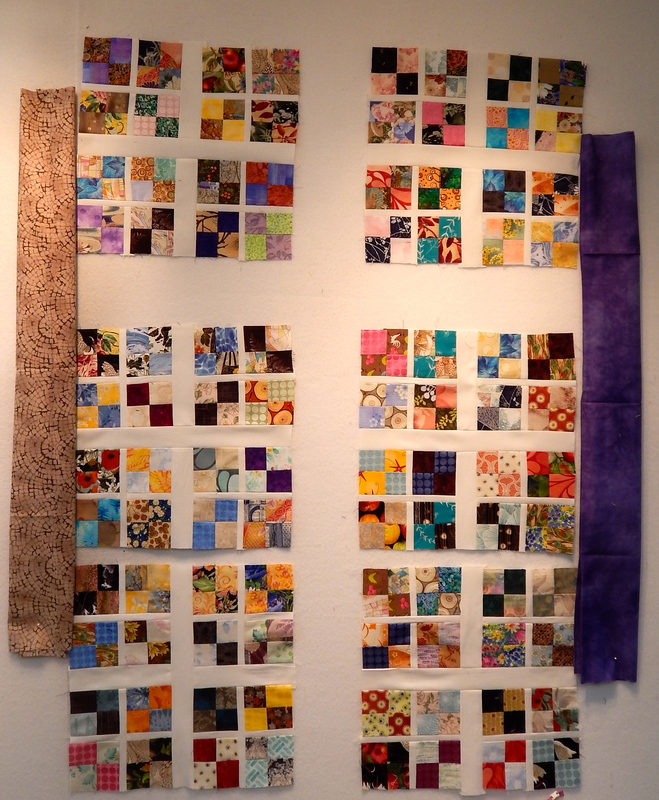 The Quilt Show requested three six-inch blocks. I made four–one for me to keep as a memento! The past two days I’ve been in my box of little two inch squares again! 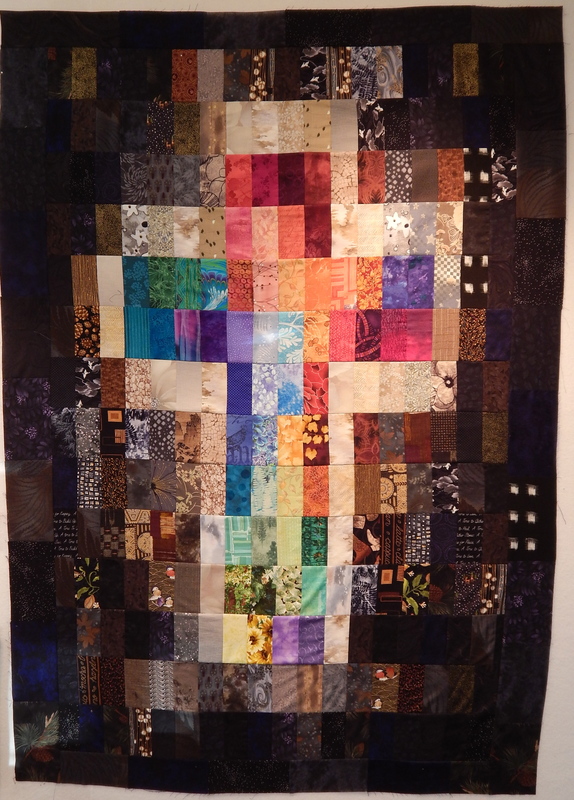 This is a version of a quilt I saw in a book. 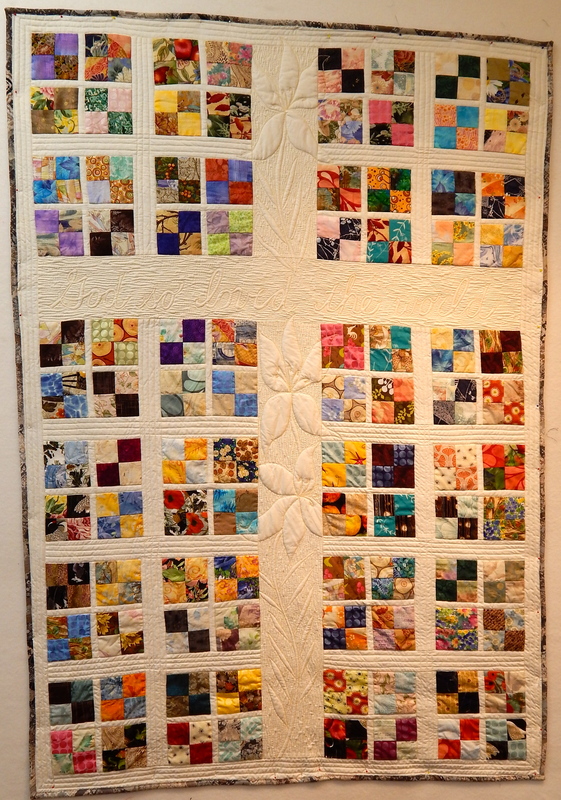 Only that book had 1/2″ finished squares in the four-patches. I knew that probably wasn’t going to happen, so I started thinking about this. And realized that pretty easily it could be made into a cross quilt. I like it. And I am auditioning border fabric there. I think this quilt might need a border. I’ve set myself an ambitious schedule for the next couple of weeks. Later, I’ll tell you exactly why I am doing this. 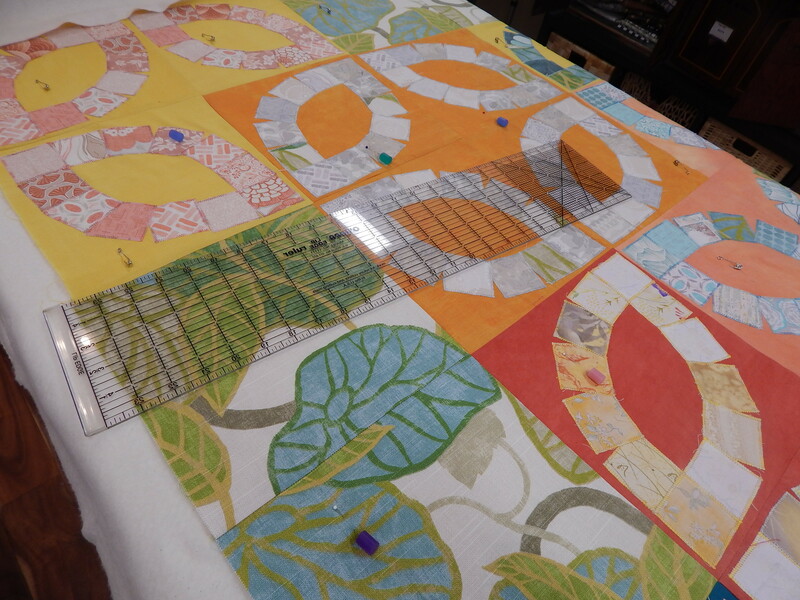 Today I was very pleased with myself–I put the finishing touches on THREE quilts, two of which had been “in the works” for months (if not years…) Oh, and the thing that I was most pleased about? I found a particular piece of fabric that’s been missing since I packed up all my stash before the studio was built!! First, I put the binding on “Stars in the Garden.” I think I’ll call it that since it was a star workshop that I took with Alex Anderson in the beautiful gardens at Alden Lane Nursery. It finished at about 50″X65″. Next up, I finished “Found,” from Psalm 139. It is part of the Psalms series. 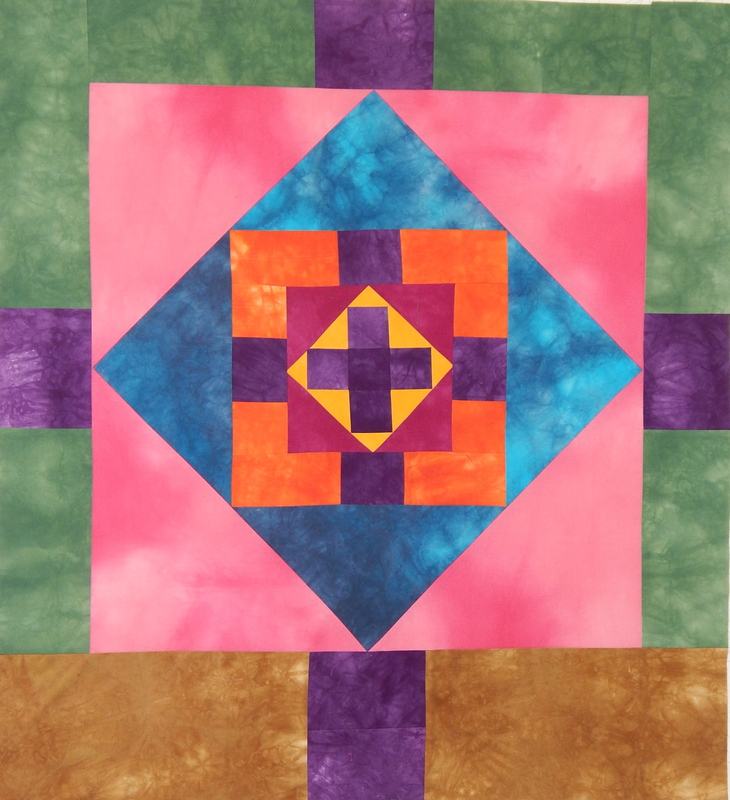 I really enjoy creating these quilts and choosing just the right Psalm for the particular quilt. Most of the time I use a modern version of the Bible for the words on my quilts. This particular verse is from a favorite Psalm of mine way back when I was in my 20’s and at that time I was reading the Revised Standard Version of the Bible. I don’t read that version much any more, but I do still like it. The language is very beautiful. 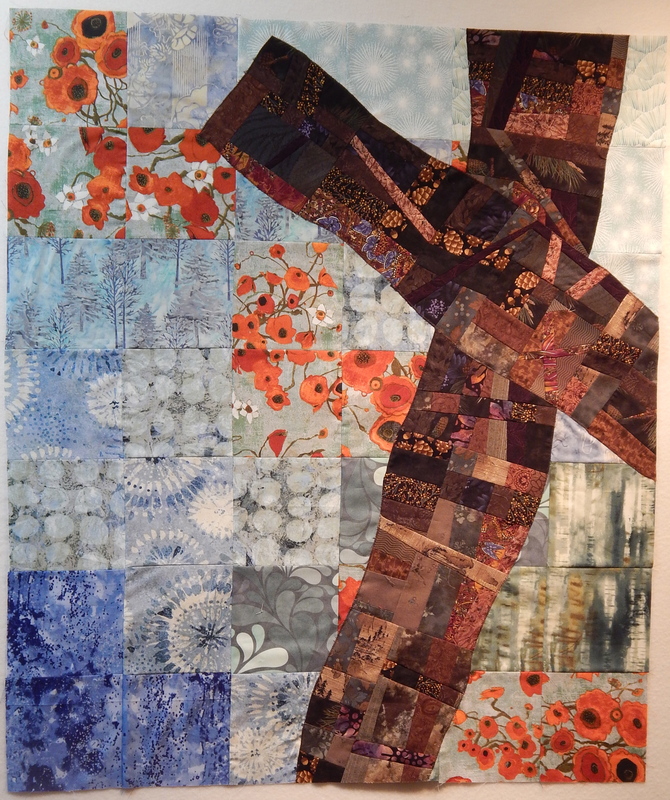 This quilt is about 26″X40″. Three quilts, three different sizes, all finished. Now that’s a good day! 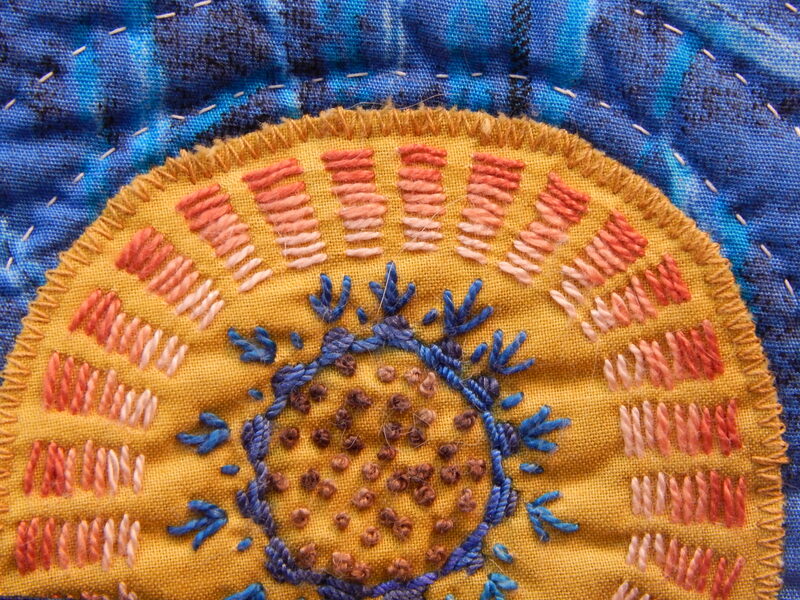 I put the last embroidery stitches on last night, and added the machine quilting this morning. Now I just have to decide if I want to cut it down to the 7X 10 size constraints for the SAQA exhibition, or if I want to make another smaller one for SAQA. Either way, I think I will make another of these. I enjoyed the process, and the size, and like the outcome.